For the three dozen Massachusetts CDCs that recently received notification that they are recipients of Community Investment Tax Credit (CITC) allocations, this is a time of challenge – and significant opportunity. The tax credits are complex to explain. On top of that, there’s a too-good-to-be-true aspect to these incentives, which may make people suspicious. How can you effectively get your message out to prospective donors? CDCs may have some people and institutions in the community who know you and are supportive, but they probably do not think of CDCs as a destination for significant charitable gifts. How can you convert a friend who currently gives you $1,000 to sponsor your annual event into a $10,000 or $20,000 donor? The pressure to get these credits issued within the short 2014 time frame – and to get them issued early enough in the year to allow you to receive more credits in January 2015 – is creating a sense of urgency. But even as you are chomping at the bit to get these gifts in hand, keep in mind both the short-term challenge – to raise a significant sum in a hurry – and the long-term opportunity – to build relationships that can help you next year, the year after, and even after the end of the projected six-year life of the CITC program. One important suggestion: In your urgency to reach out to donors, don’t rely on sending letters. In-person visits are significantly more effective than mailing out a letter or an email. In-person visits allow the prospective donors to ask questions and to focus on what this program is all about. It gives them a chance to get to know you and your CDC. Letters are fine for routine appeals from organizations people know well and are used to supporting. That’s not the case here. This is an unusual appeal from an organization that probably is not high on the donors’ list of philanthropic priorities. The donors have to get to know you. They can best do that in person. A second suggestion: Create a plan that both meets your short-term needs and promotes your long-term opportunities. There are two wonderful aspects to the CITC program: 1) if successful, your CDC will get a significant injection of capital, and 2) you have an excuse to build important charitable partnerships in the community. Those partnerships will take some time to develop. 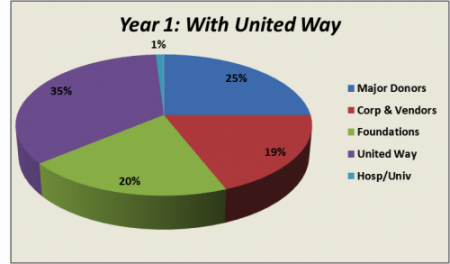 So in this first year, depending on your unique situation, you might want to maximize the offer by United Way for (let’s say) up to 1/3 of your tax credit allocation (see graph below), while you patiently go about developing relationships with individuals and businesses. So take a deep breath. Think both short- and long-term. And get to know people face to face. You’ll find this sort of fundraising more fun than you fear, and remarkably important for the future of your organization. Let’s say you are already comfortable with these fundamentals and you are getting started on this six-year journey to significantly improve your revenue model. How do you prioritize between approaching foundations, individuals or local businesses for support? Importantly, how should you think about using the services of intermediaries such as wealth managers? Below is a simple list of questions to ask yourself. What is the likelihood an approach to this prospective donor (or connector to a donor) will result in a 2014 gift? What is the likelihood we can build a relationship with this prospective donor that outlasts the tax credit program (i.e. it is not motivated 100% by the tax credit)? What is the likelihood we can obtain a sizable gift from this donor without needing to utilize the tax credit allocation? How likely is it that this donor may become a connector to other prospective donors – reducing our donor acquisition costs over time? It would be convenient if you could simply develop a numerical score for these questions, calculate the total and go with the highest score. Of course it isn’t quite that simple because each organization is starting from a different place and with differing skill sets and networks. An organization with a $1M annual budget seeking to raise $120,000 is in a much different place than one with an $8M budget seeking to raise $200,000. Also, to a certain degree you will be guessing about the capacity and interest and motivation of your potential donors. This is not an activity with a lot of certainty. Nevertheless a few common threads will often surface in addressing the questions. First, while intermediaries such as wealth managers will theoretically expand your donor pool a great deal, they will also act as a relationship filter – or even a relationship wall – between you and the donor. Thus, intermediaries should largely be seen as supports for your short-term or at most medium-term motivations. You don’t want all the clients of well-intentioned wealth managers to cease being donors simultaneously at the close of the program. Second, a foundation is required to make grants each year and as such doesn’t need the tax credit incentive to “get in the game.” The foundation will continue to have this mandate once the tax credit program has ended. There may be a fit for foundation giving in certain circumstances, but be cautious about your approach and clear on why you are approaching a foundation rather than individuals or businesses. A more exciting role for a foundation would be to provide a gift for your campaign but publicly announce its intention to forego the tax credits in order to make them available to donors with state tax liability – a truly charitable act! By the end of a few years, you will have built up a pool of individual and business supporters who have gotten accustomed to writing significant checks to your CDC – and it is those people who may well continue to support you long after the tax credit program concludes. Alan Cantor (al@alancantorconsulting.com) is principal of Alan Cantor Consulting LLC and Gregg Davis (gregg@impactconsults.com) is owner of Impact Consults.